The Dualist Inquiry Band is playing on the Red Bull Tour Bus. It’s a bus. And they’re playing on the roof. Takes me all the way back to Shah Rukh Khan grooving on a moving train when some of the cheesier bits hit. In any case, so there I am, watching Dualist Inquiry Band and sitting on those red beanbag-type things filled only with air, which you’re allowed to take home. I see Jivraj Singh, the prodigious drummer from Calcutta. I notice that there’s something very aesthetic about a side-view of the drum kit – it’s a necessity here because the bus doesn’t have enough space for a frontal setup, but it just looks so much better to view the drummer from the side. 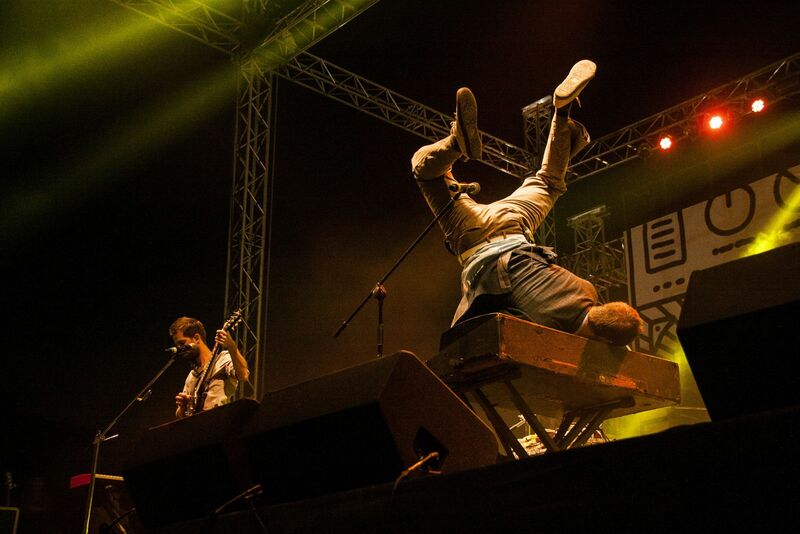 Mutemath does it, Incubus does it. This bus does too. He’s got electronic triggers on his drum kit, and the drums sound exactly like drums in EDM normally do, even though he’s playing live, not pushing spacebar. The guy can seemingly do anything, with drum stool or without. Sandunes is playing the keys, triggering sounds, running things through a laptop – I’m not exactly sure what she’s doing since there are so many electronic samples that are assaulting the airwaves that it becomes hard for me to separate individual sounds. Dualist Inquiry is playing the guitar and working the keys and a laptop, most likely a Mac. The music is arranged well, the production is fantastic, the performance excellent. It’s meant to make you groove. But it lacks soul. All I can think of is Plastic. Almost (but not quite) as if they’re playing to the gallery. There are about 800 bouncing people in the crowd who would beg to differ, but everything just sounds so over-processed. So heartless. So rehearsed. Maybe so manufactured. So perfect, too perfect. And then those guys broke into Daft Punk’s ‘Get Lucky’. Why is everyone covering that song? The next day, the Karsh Kale Collectiv [sic] and the “NH7 All-Stars” also played a version of ‘Get Lucky’. Most artists over at the electronic music stages covered the song too, I’m assuming. Enough already – there are over seven billion songs that exist in the universe – if you must cover a song, maybe pick a different one. It’s fast turning into the Maiden-Metallica-Megadeth trilogy. Aka a farce. Never though a song would turn into a farce; oh, well. Not that a minor degree of cynicism should taint an entire festival. 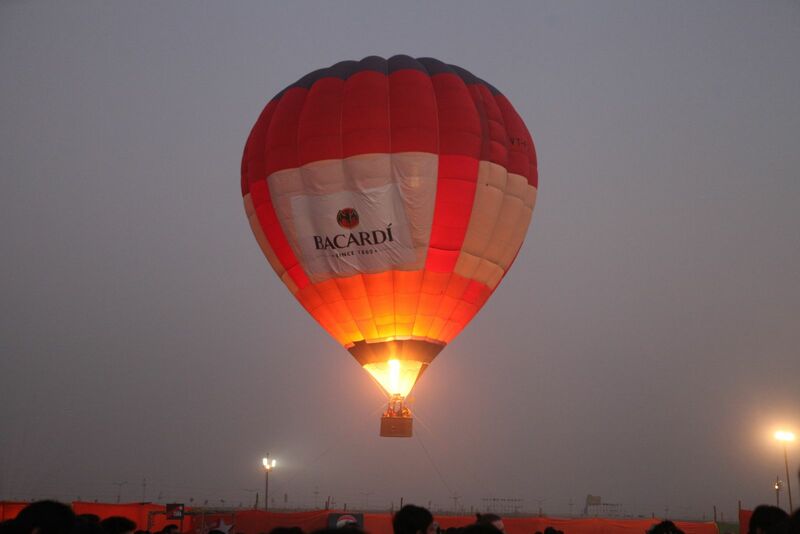 In a nutshell, the Bacardi NH7 Weekender, NCR edition, held on November 30 and December 1 in the distant locales of the Buddh International Circuit, all the way in Greater Noida, some 60+ kilometers away from any given place in Delhi, was an experience. It was a music festival where the “music” was at par with the “festival”. So fans could check out tons of artists, from Meshuggah for the guys in the black T-shirts to Benga, Michael Menert, or Shiva Soundsystem for, you know, the guys in the Day-Glo T-shirts. But it was cold there, even colder than Delhi since it was a huge open air festival a fair few miles away from any kind of civilization, so I can’t decisively state the colour of people’s shirts, or indeed, their skin. And for the casual attendees, they could just as easily get lost in the massive flea market located bang centre of the festival. That’s how they designed the festival – a centre space with the bazaar and the food court, around which the stages were placed in a circular structure, a bit like Connaught Place. I believe this was done to prevent any sound spillage while also making sure people didn’t have to walk as much as they did last year. (It was also incredibly confusing, although that’s more due to my lack of any discernible sense of direction – they had maps and boards directing crowds every 50-100 metres or so.) A huge Ferris wheel was transporting excited festival-goers into the upper realms of the atmosphere, for a small price, I think, and then back down, and repeat. Very fancy, very cool – lots of novelty there, I thought. People were lining up. Soon enough, I noticed an actual massive hot air balloon, and people could actually take rides in the hot air balloon to get a bird’s eye view of the festival. In layman terms, that’s called upping your game, and the Weekender is fast becoming one of the foremost indie music festivals in the country, especially in terms of production, execution, experience, and scale. Although I’m not 100 % certain it’s an “indie festival”, so let’s just call it a non-mainstream music festival catering to (mostly) indie audiences and tagalongs. Moving on, there was also a flying remote-controlled mini-drone (/flying robot) patrolling the area at the bazaar. For some reason, people were trying to throw stuff at it. Nevertheless, there was a happy vibe. Although, oddly enough, I did notice at one point that the electronic stage, the Wolves Den, was practically empty. There were some 50 odd people behaving all drunk and that’s it. Which is really strange because, in Pune, that same stage is almost never empty – people get there before the festival begins and leave well after it’s over (if at all). But in Delhi, the two electronica stages weren’t always packed. Instead, people thronged to the two main stages – either the Bacardi Arena, which had the aforementioned bus as a changeover stage, or the Dewarists stage, which had the Other Stage accompanying it. Lucky Ali played on the same Dewarists stage on Day One, and people loved him. They really did. So much so that he sang ‘O Sanam’ twice. He also played the song from the Dewarists, and that other really popular Lucky Ali song, and some others. And he had an army of musicians accompanying him on stage. As far as personal highlights go, though, Northern Irish instrumental four-piece And So I Watch You From Afar (ASIWYFA) has to rank at the very top (read our interview with Rory Friers of ASIWYFA here). They were punk rock in the most honest way possible – sure, one wouldn’t call their music “punk rock”, but the energy, the integrity with which they played their soulful, drifting instrumental passages driven by a fundamentally restless energy, and oh that live act, it all had this aggressive and straight up sensibility about it. They managed to make a couple of thousand fans in the audience watch their entire set with only a couple of vocal-driven songs – even cops in the crowd were busy taking videos of the band from their cell-phones: “What are these loony white boys up to?” I could hear their inner voices say. Their fast-paced, guitar-heavy, and purposeful sound lends itself perfectly to a live setting, as does their roving carefree presence on stage, and sure enough, they didn’t disappoint, winning this reviewer’s “best act at festival” award. Their drummer was playing without a shirt, so I’m guessing he carried a nasty cold back with him. Delhi’s SundogProject were quite fantastic too, as they played songs off their debut, Hex 1/Visions. There was a fear that their murky, experimental, guitar/electro-driven sound might not quite translate into a live setting. And on top of that, they have some three guitars, four laptops, keys, drum triggers, hundreds of backing layers, all playing together. People in the industry call that a logistical nightmare or a trainwreck or something. But no such issues; they whipped out an excellent performance on the day, actually sounding and appearing like a very solid band playing on stage, not just a bunch of musicians playing at a festival. That coherence is what stuck out the most. 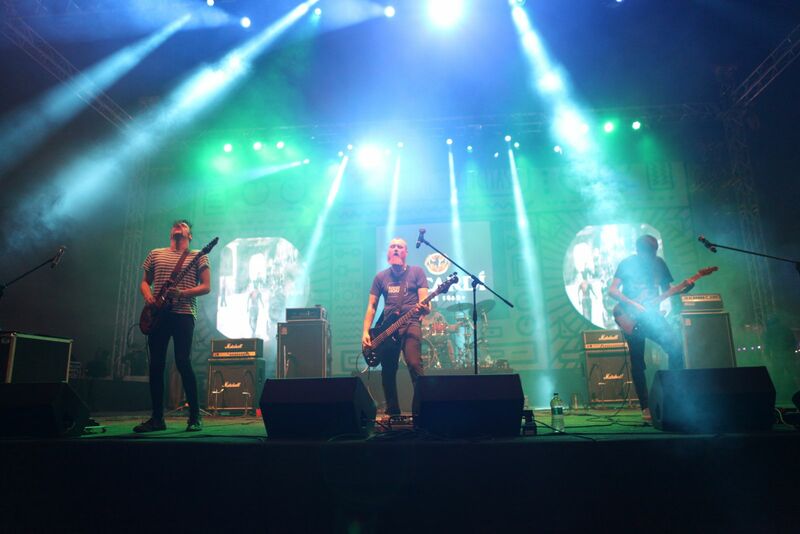 It’s a pity that it wasn’t dark when they played – the ominous sections of their music would really work well in the scary city of Noida after dark – anything (literally) could happen. Oh, and they played right after MoonDogs; is that what they call serendipity? Or perfect harmony or something. Just like the sun follows the moon, and just like clockwork, the moon follows the sun. Click here to read Odds and Ends - Bacardi NH7 Weekender, NCR, a collection of stray observations and thoughts about the festival.